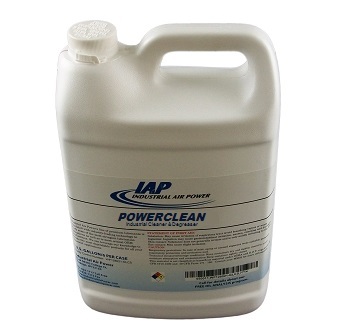 POWERCLEAN is a water-based, industrial-strength degreaser that is ideal for use on oily and greasy surfaces such as compressed air systems, heat exchangers, cleaning vats and greasy floors. The super-concentrated formula is biodegradable, nonflammable, nonabrasive, noncorrosive and nontoxic, making it safe for just about any industrial application. Directions: Dilute as recommended below, spray on and rinse thoroughly.